Almanac Predictions: Cold Wet Winter? During the high heat of summer, it’s nice to think that cool weather is coming. Add to that the year-long drought we have experienced in Central Texas, and the thought of wet weather is very welcome. 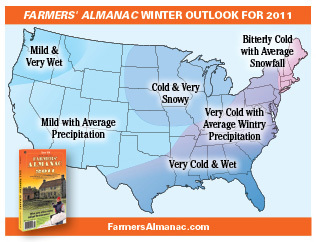 So the Farmers’ Almanac prediction of weather changes in our future is refreshing news. Some may be skeptical when it comes to long term weather predictions. But the Almanac’s prediction of several blizzards during winter 2010 proved to be true, with “Snowmageddon” hitting the north-east. This year, the Almanac predicts a storm track crossing the Gulf Coast and Southern Texas, bringing plentiful precipitation to this rain-starved land. In shorter-term weather predictions, the Almanac expects some thunderstorms over the South Central US during the month of August. The beginning of August is predicted to be hot with thunder storms, but near the end of the month storms should bring clear, cool weather. In September, we can expect tropical storms, fair weather, and more thunderstorms. See www.farmersalmanac.com for more information about their weather predictions. These changes in the fall and winter should bring some nice days to get out on the trails in your favorite greenspace. See you in the parks!